Dominique Boutaud was born and raised in Nice, France. Since her childhood she has always been involved in creative works of all kinds, beginning with drawings which she often made in the company of her father. In her life and through her painting, she gained technical familiarity with expressive works in many medias. She moved to USA in 1996 and since this time she has continued to develop her artistic talent. 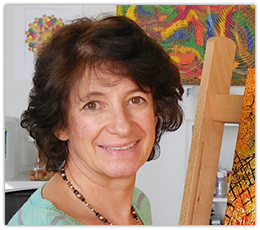 She has done exhibits around the world from USA, Spain, Monaco, France, Germany, Switzerland, to China, Japan and Italy and become an internationally recognized artist. Dominique, in the past years, has won many awards from many different countries. Among them are the Gold Canvas award from France, Academical Knight from Italy, Excellent Art Prize from Japan, Master from New York, Trophy of Peace and recently Apollo, Francesco il frate di Assisi and Maestro d'Arte awards from Italy. As abstract artist painter, I create artwork for a quest of meaning, authenticity and expression of hope, serenity, peace and happiness for me and others for our future. In my heart, painting is a way of living honestly and having a role as protecting peace and defending human rights in the world.